Shops are open 7 days a week, from 8:30 to 5:00 with some shops having slightly different hours. Some shops are closed on Sundays but not all. It is very crowded on Sat-Sun and holidays. 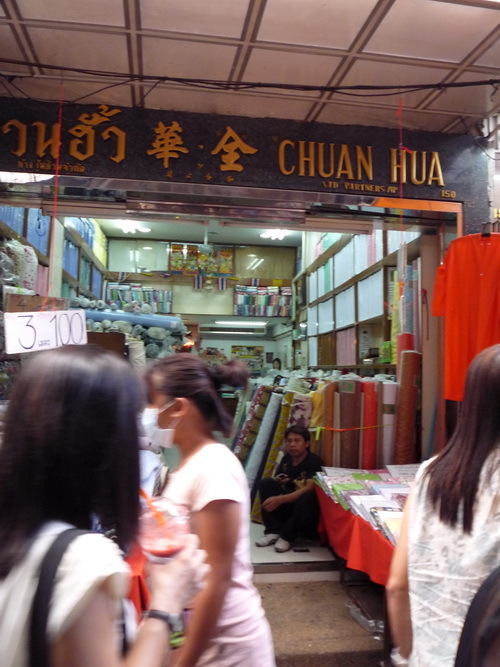 The walking lane in Chinatown, Bangkok, is known as Sampeng Lane (signs say Soi Wanit 1) and it’s the only place in all of Thailand to get cotton quilt fabric at cheap prices. 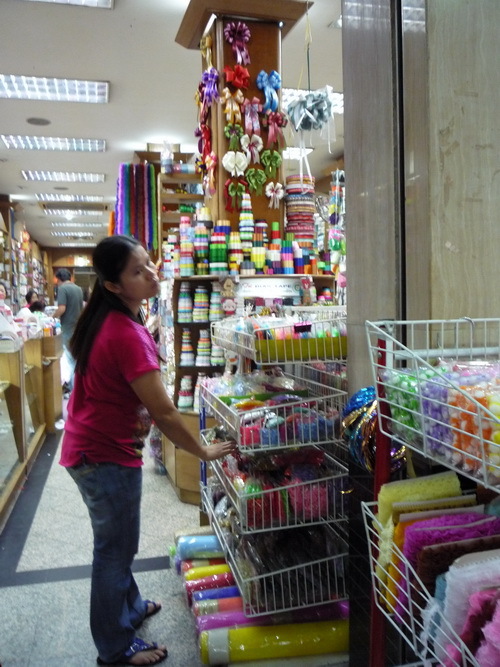 There are a lot of fabric shops! Diana drew up a map showing the shops that have 100% cotton. Bolts wrapped in plastic are for sale by the bolt. The shop numbers go in order so you can find a shop by it’s number with even numbers on one side, odd on the other. 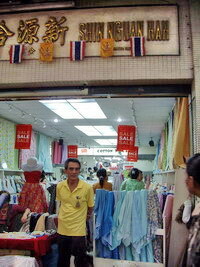 If you buy less than 10 meters of fabric, the price is retail but still cheap, as low as 35 baht per meter ($1 per yard). If you buy 10 meters or more, which can be various fabrics from one shop, the price is wholesale which means about a 25% discount. Minimum cut is 1 meter, sometimes 2. The shopkeepers are honest and the prices are low. Watch out for pickpockets though. The closest skytrain station is Hua Lampong, or Wong Wian Yai and get a taxi to Sampeng. Or arrive by boat at N 5 Ratchawongse or N 6 Memorial Bridge (Saphan Phut) and walk. Don’t bargain! It’s not a bargaining place! If you buy in quantity, you get the wholesale price. For example if you buy a dozen sarongs, or 10 meters of fabric or more, you get the wholesale price. These shops sell in quantity! Thanks for reading and have fun! #185 Giansingh Amarnath – we call it the Treasure shop. Be sure to check in here to see what they have today. They sometimes have fabric collections by Moda and others. 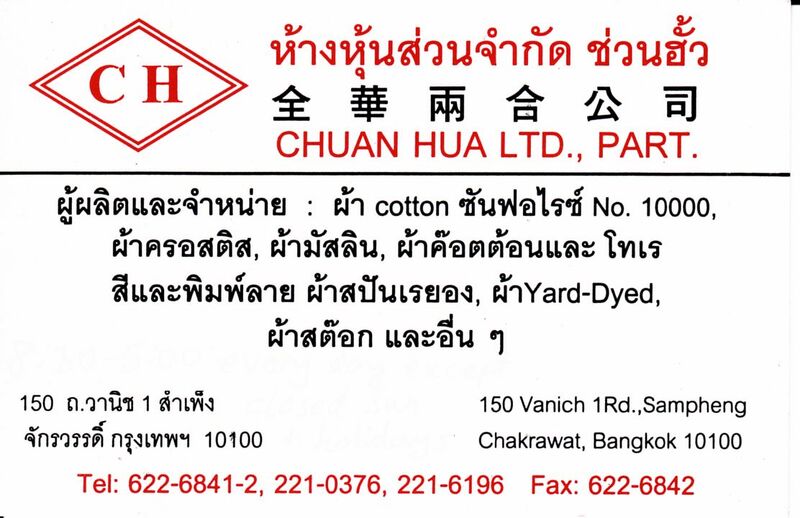 #150 Chuan Hua – 3 meters for 100 baht cotton fabric including RJR, Jinny Beyer and Thimbleberries. This is the best value around! 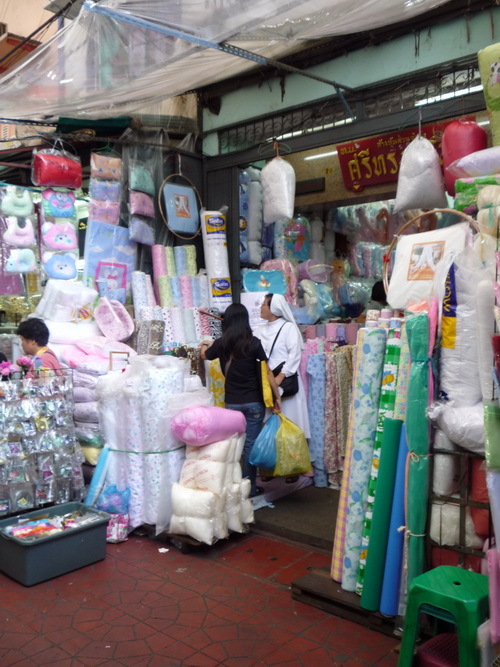 #78 Sri Song shop – batting, flannel, plastic sheeting, mosquito nets, baby clothes and bedding. They sell white polyester batting in either thick or thin, brand name ‘Double Swallow.’ The thin batting is 45 inches wide and the price is 45 baht per meter. #60 Pornsawad – felt by the meter in 26 different colors. The price is 100 baht per meter. It is 36 inches wide. They also stock lace, lining, lightweight cotton fabric in solid colors, net, burlap, tassels and velcro in many colors. #96 Vibul Kit – sarong fabric which can be used for quilting. It is owned by Adella. We stop by here often to see if new designs are out. Linda can’t go past this shop without buying more fabric! #277 Fabric House – every fabric in this store is guaranteed 100% cotton. They have fat quarters, remnants and imported Japanese fabric. Hi, can you please suggest where I can get wedding dress fabrics like cording lace, french lace, beaded lace? Hi there! Do you know where I can buy wadding for quilting please? And temporary fabric spray glue? For batting/wadding Sri Song Swad shop #78 Sampeng Lane, they also sell flannel and other baby related fabric, and Pornsawad Shop #60-62 Sampeng Lane. For fabric glue #48 Hong Garment Accessories. I haven’t been there in a while. If you go, let me know if this is correct, thanks! I am curious if there are any longarm quilters in Bangkok and what they charge. Are there any handquilters for hire? Hi can I know where or which shop selling the sequin trimming (40cm) for Latin dancing dresses. would you PLZ tell me where are the representation of the ROBERT KAUFMAN and the HOFFMAN in the BANGKOK. Très heureuse de découvrir toutes ces infos, je viens d’arriver en Thaïlande, et fais du patchwork depuis un bon bout de temps. Je vais aller y faire une virée pour de beaux achats. A tout bientôt pour des nouvelles, courant novembre. Pour l’instant, on s’installe …. Amitiés. The shops will be open. Sorry about typos – was doing this on my phone & autocorrect made a mess! 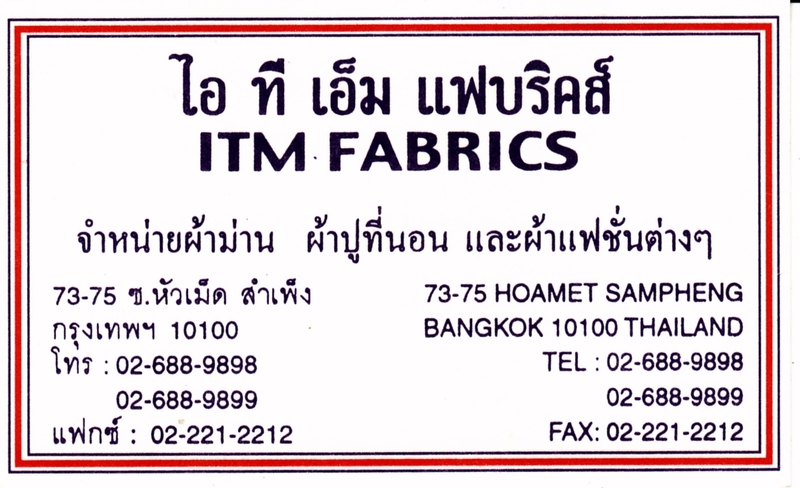 Should read ‘lowest price 40 baht per metre’ and ‘reckon I have about 30m of fabric’. Hi I m looks big for viscose print which we see in beautiful dresses in bankok.. I m from Sri Lanka all the way.. I couldn’t find beautiful viscose since I have a skin irritation for synthetic fabric.. I m leaving tomorrow ..
hi , I just wanted to thank you for providing such a great resource. I am gathering fabrics for our “Days for Girls” team and going to try and find a flannel supplier and a second snap machine so you have given me some great places to try. I am also hopeful to find little plastic poly pellets, we can’t get them here in Oman so I am wondering if these are something you have seen in bagkok. Anyway just wanted to say thanks , I know its an old post but it has obviously helped loads of people. hi again, I just wanted to say thank you to Jill, this map way brilliant. I spent 4 hours making my way down this “lane” it was brilliant. Sadly no one had flannel but I did find loads of other goodies. Dear Jill, when I was in Bangkok a few weeks ago there was a shop at sampeng lane selling only iron on patches – but thousands of it. Could you help me out with name and contact details? I wanted to order some of these patches online. Thank you! hi, I stopped there and got a few (well really loads) of patches. I am currently unpacking and if I can find a receipt I will come back and post here. There’s so much chiffon at China World mall. And you can shop in air conditioned comfort. They are the same shops as on Sampeng Lane. Thank you for doing this blog. 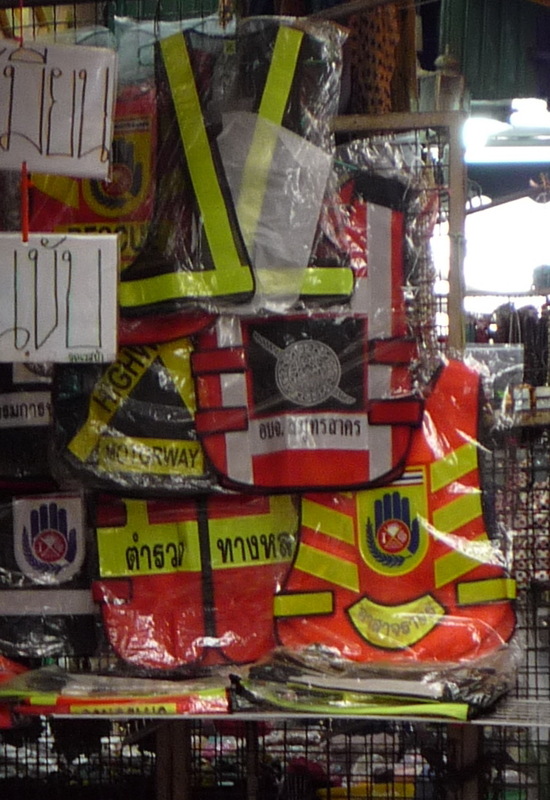 I’m currently in Bangkok I wanted to search for patches (flower patches mainly) and if you know a place where someone can stitch them in my product. Hello, Jill! Great guide! Can you give me an idea/recommendation on where I can find fabric with paisley design to be used on men’s formal vest for a wedding? Thanks! All the formal fabric is at China World in Pahurat. I haven’t seen paisley but I’ve been there several times lately shopping for formal fabric. That’s where people go for wedding attire. I just went last week and could not find the Korea Shop. it seemed to have moved according to locals. if possble accoustically transparent if anyone understands that… hope i can here from you guys asap as this we are running on a tight deadline!! Hi, I am looking for funky upholstery fabric for sofas, armchairs etc. did you ever find out? i’m in the same boat@! I want to buy tops for women with swarovski on them. Where can i find these in Platinum mall in bangkok. Can you give me the store name along with the email id of the store if possible. I want to buy in bulk. Hi, I’m looking for cotton jersey, to make t-shirts. I’ve only seen it Gemini, but they have mostly the plain colors. You any other place where they sell cotton jersey, but with some patterns? Thanks!! 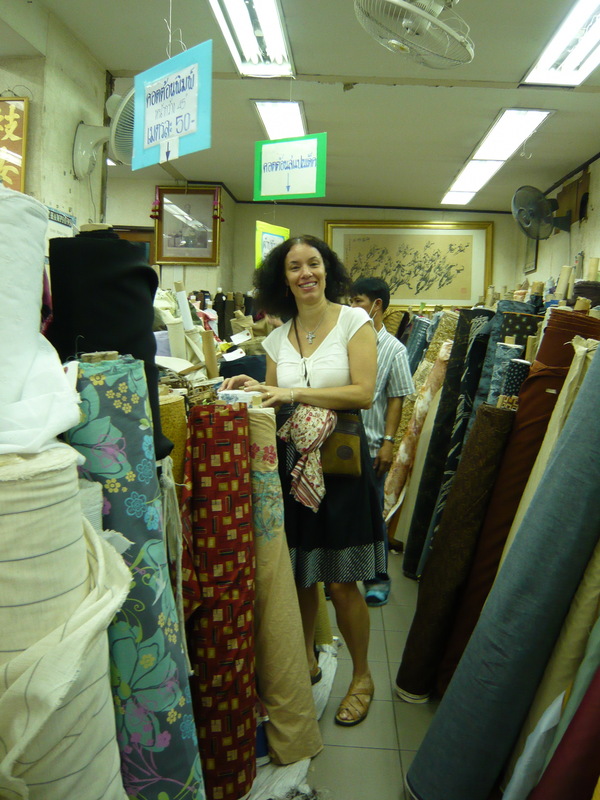 Can I find good furnishing fabric as well @ Sameng lane ? I want to buy snap button and attachment tools, can I find it here? is there any shops, where i can find a pom-pom trims and something like that style . is there anybody know where can I find leather for crafting? thanks!!! Hi. Do you know where can I buy embellishments for the gowns? Like rhinestones, beads, crystals etc. 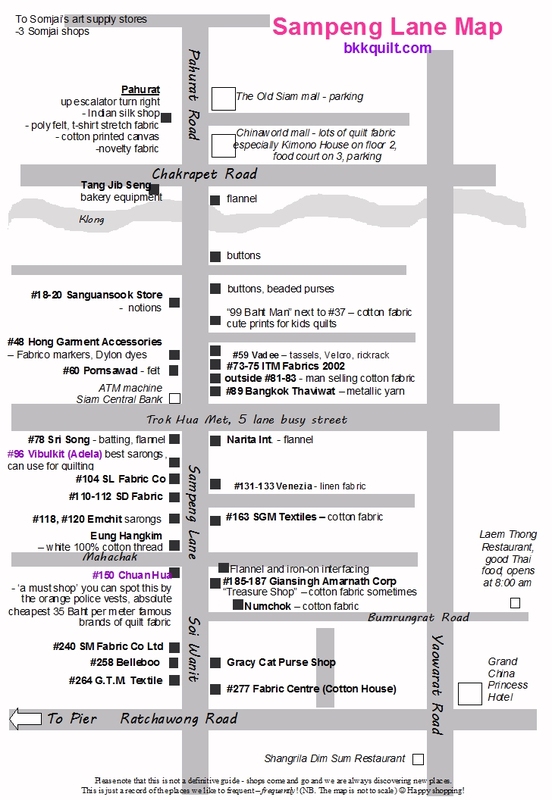 There are many notions shops such as #18-20 Sanguansook.Also see Kijrung shop #67 Sampeng Lane. Just look around there you’ll see shops selling ribbons, lace, buttons and beads. Im looking for coloured stretch cord, for jewelry. Im wondering if they sell it in Sampeng Market? Yes they do, try Loa Kwean at 123-125-127 Ratchawong Road, and Wattanaporn at 256 Sampeng Lane. Hello im reading about places such as Pahurat, sampeng lane and chinaworld. Are these places located close to each other or are they essentially the same place. I want to plan a trip to purchase quilting fabrics. Could you give me addresses. So I can locatee a hotel near by. They are located together. Chinatown, called Yaowarat in Thai, contains a walking lane “Sampeng”. 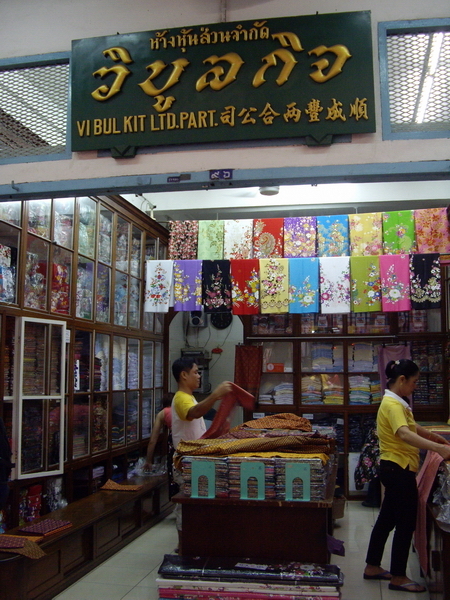 Pahurat is next to Chinatown, with even more fabric shops. 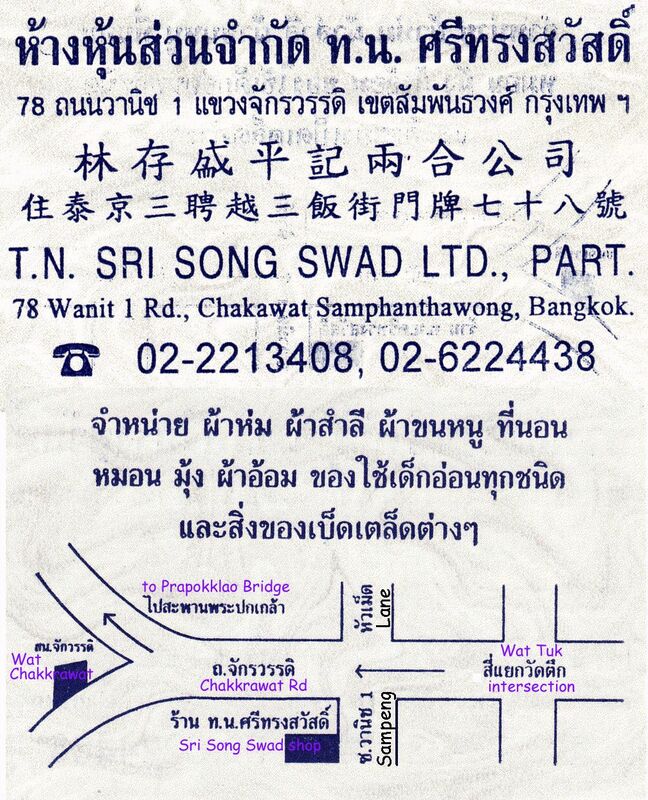 The address for the shops is Soi Wanit 1, Samphanthawong, Bangkok 10100. Mondays are good days for shopping. Start out at 8:30 or 9:00 am. By noon it gets really crowded. Hello! I love this resource! Can you tell me if you’ve seen the name brand Moda in Sampeng, and if so where I can find it there? Also where can I find flannel? Moda fabric can be found mixed in with other brands at Kimono Shop at Chinaworld. There is a lady on the corner of Sampeng Lane and Chakrawat Road selling flannel. Not in a shop, but just at a counter on the side of the road. I’ll be in bangkok very soon and I wanna buy bag making fabrics and sheets, interfacing,washer, anvil, metal frames for clutch bags and also leather, wooden handles.Could you plz tell me where can I get these bag making stuffs in Sampeng lane? Too numerous to name! You will find plenty.. 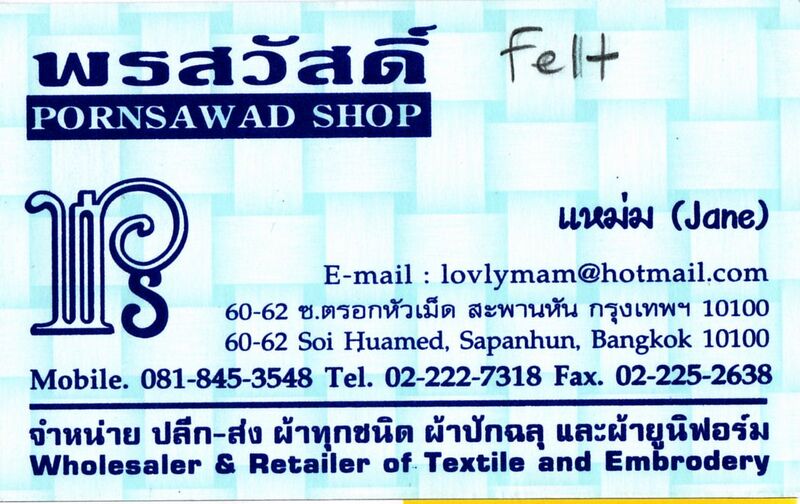 I don’t know of the nearest post office, but you will be able to mail at any one, if it’s a lot, surface mail will be much cheaper but takes 5- 6 weeks…..
i really need your help to find a tailor for swimwear in Bangkok. Lycra fabric can be found at shop next to the temple where cars park – on the way out of the temple – shop is on your right. Great Lycra fabrics in solid and print! Korea Shop, located in the entrance driveway to Chakrawat temple. My Garmin GPS coordinates are N 13° 44.555′ E 100° 30.207′ enter that in Google maps. I’m going to Sampeng Lane in March and would like to know where to find craft embellishments, bows, ribbon, cord, paper flowers etc. I was there 2 yrs ago and only found 1 shop. I was told there were/ are many more. I must have missed it. Please help and where possible give shop numbers sothat I would know which direction to go. The taxi usually drops you off and yoy join the lane but could be walking in the opposite direction. Thanks for the valuable info. In Samyakk, we have a huge collection of latest designer sarees online, silk sarees,Banarasi sarees, Mysore Silk sarees, Kanchipuram silk sarees, printed sarees, lehenga sarees and party wear sarees. Buy sarees online at best price and get free shipping worldwide. I am looking for Lycra swimwear fabric in Bangkok. Can I get it at the fabric market in Chinatown? 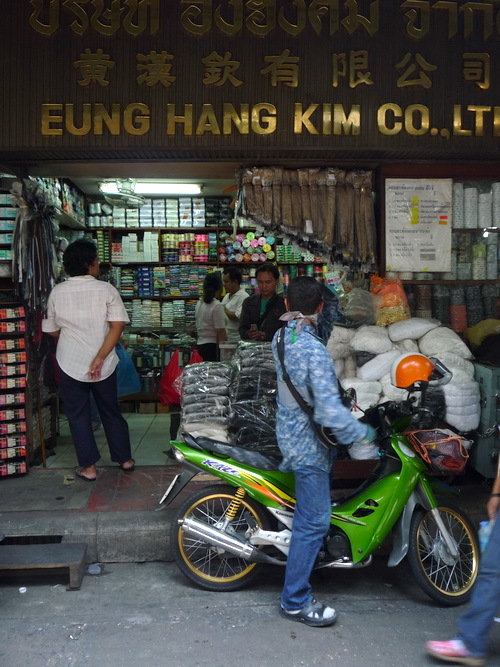 Do you know shops in sampeng selling bags for reselling? Yes there are many, most of the shops are for wholesale..
Do you have any idea if they sell fake brands like abercrombie and fitch, aeropostale, etc? Found some at MBK but they are too expensive to resell. Thanks very much..
You need to go to Platinum Mall and Baiyoke Market. In Sampang Lane you’ll find all the accessories you’re looking for, but there’ll be very little when it comes to imported quilting fabric. There are 2 shops in Sampeng, they are franchise shops and won’t be cheap compared to the market shops. ‘Fabric House’ (Written on map as Cotton House’) and ‘Kikuya’ which is on the main road before you enter the lane for Fabric House, they will have some. Also China World has a shop on the ground floor opposite True Coffee that has imported US and Japanese fabrics, limited choice but very cute and also very expensive! I was quoted between 250 -400 Baht per yard there, but the fabric is nice! I always start at Sampeng (beginning of map) and walk all the way through to China World, it’s quite a way but you get to see everything, and you come out in India town, where all the Indian fabrics are 🙂 Good luck! I would dedicate at least one whole morning and early afternoon to it! Hi! Really great information about Sampeng. Thank you for sharing! I am planning a short trip to Bangkok in Nov and would like to know how much time I should allocate to Sampeng Lane and China World. I am looking for US & Japanese quilting cottons. Other things I will be checking out are notions such as zippers, zipper sliders, buttons & cotton tape/crochet lace tapes. Which place is more worthwhile to spend more time in? I may only have from morning to around 4pm to spare. Any advice is appreciated. Oh, and which place should I go first, Sampeng Lane or China World? THank you!! So where is the t&k? Can i know which road i need to turn in to t&k seafood before i miss out? HI, Sorry I don’t know T&K 😦 Just take the lane going down next to the Kikuya shop on Ratchawong Rd, 3pm traffic will be better than 4 but going back will be very very slow after you finished shopping, if you can get there in the morning it’s much better! Hi wil be visitin sampeng lane for hello kitty stuff,ladiez shoes n clothes.. I want to buy ladies and kids dresses from Bangkok for business purpose. Can you help me in this ? I am from Kolkata, India. hi. I need the shoe and jelly slippers wholesale in sampeng. hpw u get to do fpr the material name cards etc. I need contacts for business purpose. Just wanted to say thanks for the rich and informative post. 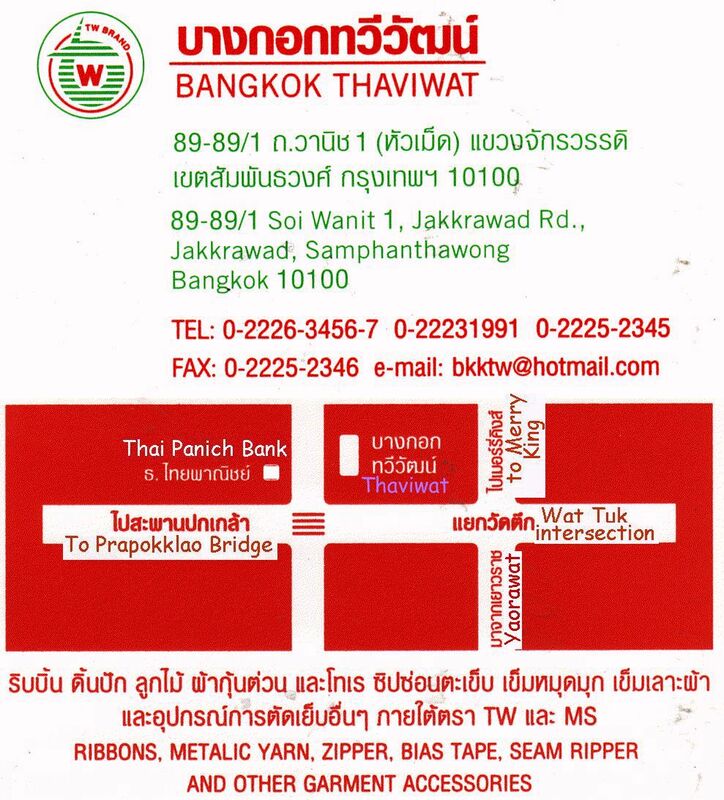 I am new to sewing and to bangkok and this is really helpful. Thank you for all this information! Being relatively new to BKK, I’m looking forward to utilizing your well done research of this area! I’ve organized a group of ladies to go shopping this weekend and your map and information is greatly appreciated! https://bkkquilt.com/2009/07/31/rotary-cutters-and-mats/ JCC Shop for rotary cutters, mats, rulers… wholesale! 2 km from pathumwan. Hong Garment Accessories on the Sampeng Map have all of these items, Rotary Cutters and cutting mats are still quite expensive as they are brand name import. I buy regular cm cutting mats in stationary shops in town (b2S etc) and mark them myself in inches, much much cheaper! quilted fabric – Fabric House/Cotton House. There’s a branch at Central World. Hi, want to buy quilted fabric for my sons school supplies, but I can’t find it in sampeng. Do you know where to buy? Btw your info is really guide me where shopping at sampeng! May i know where can i buy lycra & where shop have minky fabric? There are a few shops that sell Lycra, the best quality is ‘Gemini’ which is on the downloadable map. I have never seen Minky fabric at Sampeng, you can buy various soft furry type fabrics though. Hi, Thank you for the info. I would like to buy finished quilts in large quantity. Do you know where to go in Thailand? 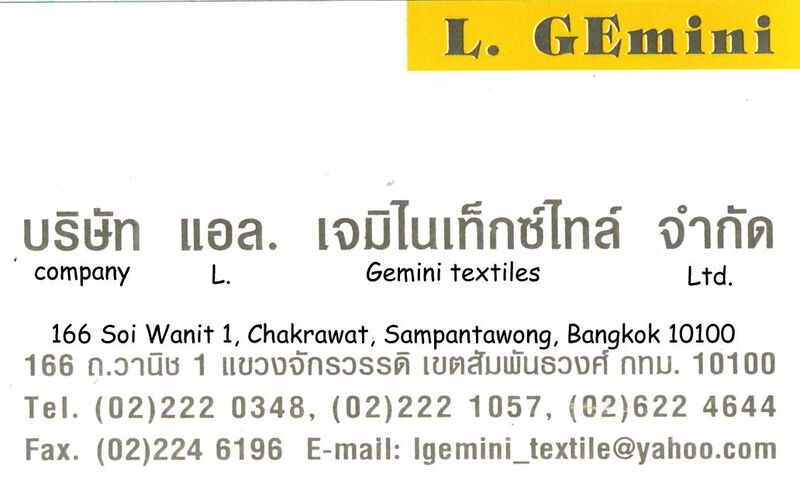 I am in BKK now, and have spoken with Gemini, but their stock is quite dull with no sheen..
DO you know of ANY other places I could try?? Hello, im sampeng market i can buy hair extensions?? Hello, I would love to know where I can get a rich supply of Japanese cotton fabrics especially the soften more muslin like printed ones. I have seen a selection at Kimono Shop in China World Mall but where else? Would appreciate the help. Hi – does anyone know where I can find wholesale stores for zippers, clasps, rings and other hardware for bags? Thank you! On the map #48 Hong Garment Accessories sells all that kind of stuff, also around that area are other shops that sells all these things. Good to know. One is an unlined simple lace jacket, one is a cotton jumpsuit, so both woven – I think I will give it a try! Thanks so much for the reply. Depends what kind of clothing it is, most tailors will copy a shirt or trousers/skirt for you but they don’t seem to copy knit (stretch) fabric stuff, I think they just generally don’t work with that fabric, I’ve asked in the past. Hi, Aside from fabrics, is the sampeng market a good place to buy other articles like bags and fashion accessories? yes, about half is fabrics and the other half is everything else, bags,clothes accessories etc. Look at the map above and just walk the opposite way at Rathawong road where the map starts, the rest of Sampeng Lane goes on from there. Hi, im planning to go there in september. Can u suggest to me which hotel is cheapest &nearest to sampeng lane/ phahurat? Tqvm. want to buy fabric for ladies dress,specialy caftan fabrics.someone can suggest where to get? Hi, I am looking for good quality flannel for kids sleepwear. Where would I look? Thanks so much. There is a shop on the ‘Sampeang Lane Map’ above that indicates flannel, but I’ve gotta say good quality flannel is something I’ve not seen much of. I want to buy a thick colored felt and I wonder if they sell it in sampeng market? There’s a few shops that sell coloured felt for around 90 Baht per meter, not sure how thick you wanted it, this stuff is regular felt thickness, 3-4mm?? Im looking for thickness ard 3-4 mm felt. Thanks for the great info. This is great info! Do you know if the shops are open on Saturdays and Sundays? I’m heading to Bangkok in a couple of months and would like to buy spandex/lycra to make swimwear for my daughter. Will I find it in Sampeng Lane? There’s’ #166 L. Gemini ‘ that sells only jersey type knits. I’ve seem swimwear lycra in only one shop which is on the same side, just a shop or few after #48 Hong Garment Accessories, they have their fabric bolts upright/vertically displayed, you need to walk through those and go to the back right hand side and there is the swimwear fabric, this is the only shop in Sampeng I’ve seen that sells this type of fabric. If you ask for Spandex a lot of shops will have it but it’s not the swimwear kind. Decent lycra fabric is hard to come by, Gemini only have mostly solid colours, the other shop has some nice patterned stuff, very cheap but low quality, the swimwear stuff that they have is an ok quality though there is not much variety. Jill, thank you for the information above on swimwear fabric. I too would like to purchase some for making swimsuits. Do you have any more current information? Do the two shops you mentioned – L. Gemini and Hong Garment still sell Lycra swimwear? Hi.. 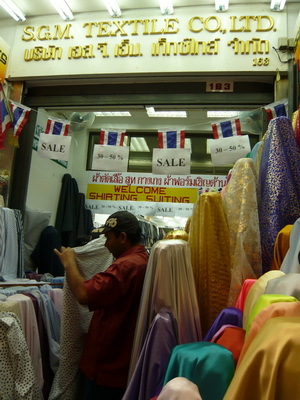 I want to buy thai silk and wonder whether they sell Thai silk in Sampeng market? 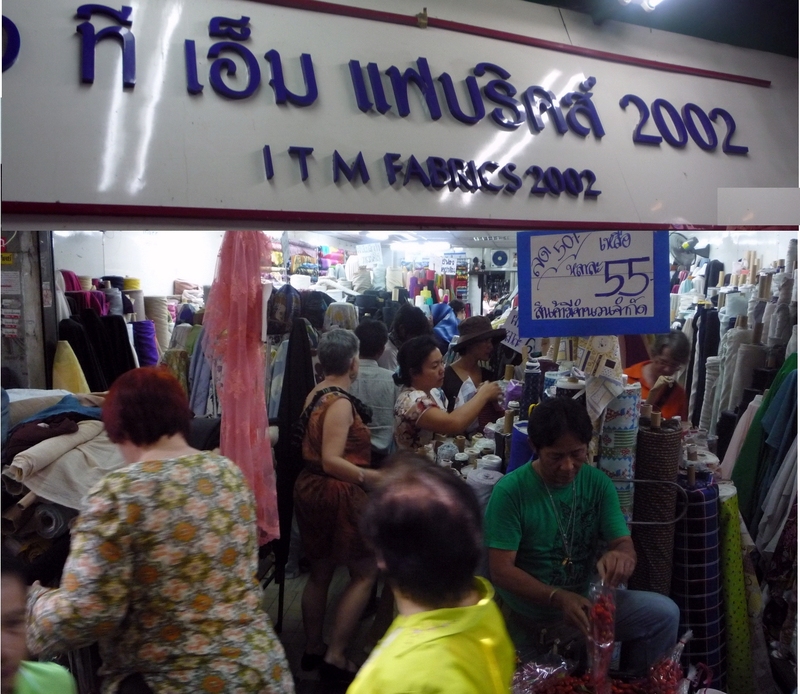 Yes there’s lots of Thai silk and a few shops that only sell Thai silks and satins. is there only one fabric shop or is there several? I was wondering if there are cotton and silk shops close by each other. 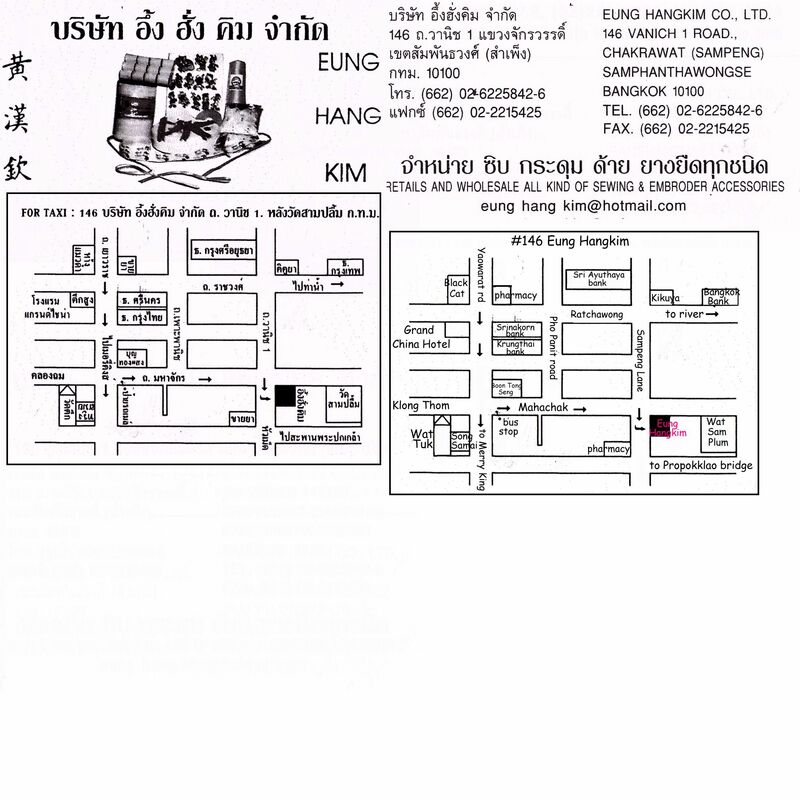 Hello my husband and I will be heading to bangkok in March 2012, is this area only wholesale or can anyone buy here? Thank you for the maps they will come in handy. You can buy any amount here, a lot of the shops sell at a discount for ‘wholesale’, which is usually always 3 pieces and up, except for the fabric shops where everything is by the meter:) Hope that helps. thank you I’m getting so excited just a little longer. Do you know if there is a place to mail the fabric? Just in case I find to many goodies for my suitcase.